Ah, love. It is such a beautiful thing. It’s so powerful that it can change your whole world. It can heal a heart and it can break it. All by the power of love. Why I’m being very Shakespeare on love today? Because today’s entry will be all about keeping the romance alive. 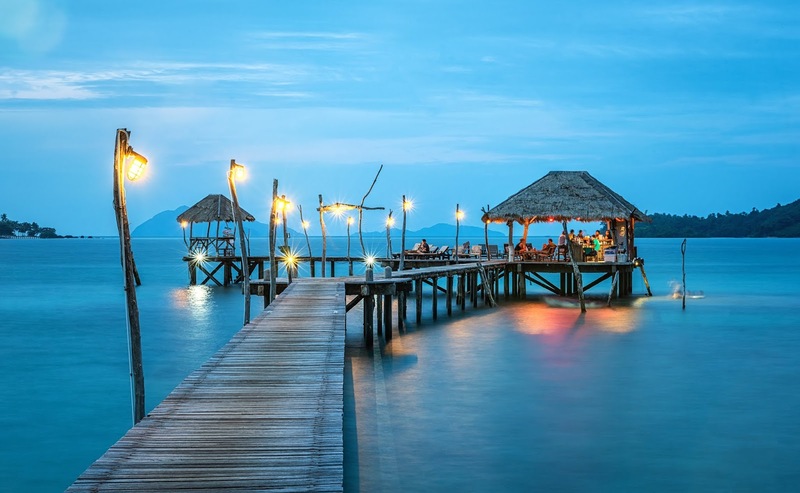 Today, we’re going to look at the top romantic getaway in Southeast Asia. For those who are planning to have a romantic honeymoon/anniversary trip, maybe you’ll want to consider these places. I’m narrowing down four of the best. I’d love to include more but for the time being, I can only provide four. Maybe I’ll add more in another entry. Relive your very own Blue Lagoon here in El Nido. This crystal clear and white-sand beach is everything but dull. This island is one of the beautiful islands in the Philippines and a perfect romantic getaway for those seeking it. This once weathered limestone provide more than just a pretty view, you can also find some of the wonderful diving spots, hiking through one of the best trails through the mangrove forest and explore the unique caves out here. Oh, and don’t forget kayaking, duh! You can go all Mamma Mia! with a boat for two while enjoying the beautiful sunset scenery when you’re ending your day. There is without a doubt that Indonesia has some of the beautiful places to visit on any type of occasion. A romantic getaway is not excluded, of course. Welcome to Tanah Lot Bali, the most beautiful scenic sea temple there is. I realize I use “beautiful” a lot in this entry, but you can’t help it though, the places I included in today’s entry is what it is - beautiful. Let’s dive into a little bit of history lesson to really enjoy the place. The rock where the temple resides was originally called Tengah Lod that means “in the sea”. This was originated by the tale of a high priest from Majapahit named Dang Hyang Nirartha, who came to Bali back in 1489 to spread Hinduism and soon find this site that remains memorable up till today. The view really brings the romanticism to life and given the history surrounding this place, I think it just made the place much more meaningful to visit. Behold the gateway to the temples of Angkor, one of the unique historical ruins in the world. For a pair of lovebirds that enjoy sightseeing historical ruins, this site is a must-visit agenda you should opt for. In hindsight, you might seem that the only thing you can do here is literally walking through the temples and only that, but this is where you are mistaken. There are a bunch of other things you can do and it is equally romantic as walking by the beach. Here, you should never skip the opportunity to ride the hot air balloon over the Angkor ruins and watch the sunrise, which happens to be the highlight of the trip. Sun makes everything extra romantic. What better love story to tell the ancient ruins than your own? Calling all thrill-seekers-couples! You might find this next destination both romantic and thrilling at the same time. We are flying to the land of the Merlion to touch the sky in a 165 meters high observation wheel. The Singapore Flyer was deemed Asia’s Largest Giant Observation Wheel for all the right reasons. It is definitely an intimate place worth visit to enjoy the city views at night. The panoramic views of the Marina Bay certainly give you that romanticism edge to it, don’t you think? Or maybe if you have found the person you want to spend the rest of your life with, who knows, this might be the best place to pop the question! Singapore Flyer is not a stranger to people proposing on its site before, why not be the next one in line? And there you have it, some of the romantic getaway you can hop on a ride with your significant other. Of course, the list does not end there, there are also other places I did not cover in this entry. Do you have your chosen romantic getaway you love to escape to with your loved ones? Let me know all about it! Share your stories with me and let’s spread the love because clearly, the world needs a bit of that nowadays. Our skin changes as we grew older. As time passed by our metabolism of cells becomes slower. Mature skin happens when the amount of activity of fibroblasts is reduced as well as the synthesis of collagen. Our skin becomes dehydrated and age dark spots appear. Mature skin care is to identify when you see the sign of open pores, hyperpigmentation, wrinkles, lack of luminosity, dehydrated and lack of tone & firmness. This lead to the 8 signs of ageing which are the partial lines on forehead, between eyes, eye area, under eyes, laugh lines, lips & neck, outer lines of the face that connect from the cheek to jaw. The new Yehwadam Nokyong Collagen Contour Lift Gold Capsule Cream from THE FACE SHOP is made especially for mature skin. It is a concentrated lifting care cream that contains nokyong collagen that lifts the 8 ageing lines for a firmer and youthful skin. The Yehwadam Nokyong Collagen Contour Lift Gold Capsule from THE FACE SHOP comes in this luxurious box with a scoop in it. This is the 3rd type I believe from their "pearl Capsule" cream line. They have the Yehwadam White Ginseng Collagen Pearl Capsule Cream for Dry Skin & The Yehwadam Snow Lotus Brightening Pearl Capsule Cream for Brightening benefits. 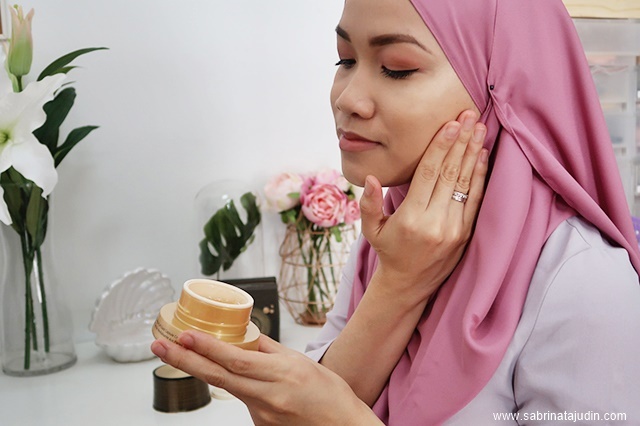 Some of the ingredients that caught my attention are Panax Ginseng Root Extract, which the reason behind this cream gives me a cooling and soothing effect when applied. Another ingredient is the Pearl Powder, which for centuries pearl was the elite natural medicine to promote radiant youth. Then the start ingredient which is the nokyong collagen, which is derived from the premium eastern herbal ingredient deer antler. Each jar contains 50g of cream. For hygienic purposes, simply use the scoop to take out the product. I love how this cream comes in these pearl looking jellies. These are called capsules cream. How to use it? Simply scoop 1-2 pearls and squash it using the scoop on your hand and gently massage it on to your face and neck. The pearls dissolve into a very gel-like consistency that absorbs nicely on to my skin. After applying the cream looks very nourishing on my skin. I have been using this for 1 week plus and I am very impressed with it. It is so hydrating and makes my skin feels much more supple and plump. The instruction said to use 3-4 capsules but I only use one per routine. One actually already give the right amount to cover my whole face. I use this after using my serum. As I squashed it, it just melts onto my skin and feels so nourished. This cream is not fragrance-free, so there is some scent in it but I find that the scent is very refreshing. I found that after 5 days of using this, I can see that my skin is radiant and hydrated. It is best to use 2 capsules during night time as a sleeping mask too. Back in 2012, I reviewed a product that changes my life completely, you can check it out here. I experience acne during my early 20s, and every time of the month, I usually will get at least one acne. Which is such a frustrating moment? I have a bad habit of squeezing it and it causes scars on my face. The black marks on my face will last at least 2-3 months. But when I discover Hiruscar, it solves my problem completely. Watch my video below to find out more on how to use these Hiruscar Anti Acne range! The Anti Acne Range comes in 4 steps & 4 products you can include in your routine. The ANti Acne range helps to heal and reduce acne conditions like Blackheads/Whiteheads, Papules and Pustules. There are as below. Step one is the cleanser, Hiruscar Anti Acne Pore Purifying Cleanser. This is a gentle, sulfate-free, oil-free and colouring free cleansing formulation. That means it is suitable for people who experience acne prone skin problem. This cleanser does not leave my skin feels dry/tight. It is gentle and does not cause irritation to my skin. The second step is using a serum. This Hiruscar Anti-Acne Pore Purifying Serum also acts like a toner +light moisturizer for your daily use. It is formulated with special ingredients such as Bisabolol, Laricyl (Mushroom Extract), Salicylic Acid, Allium Cepa to help not only to minimize acne breakouts, but also tighten pores and promote skin elasticity. The 3rd step is spot gel to treat your acne spots, redness and pain after 2 days of usage! The Hiruscar Anti-Acne Spot Gel contains salicylic acid and otheranti-acne ingredients for reducing acne. It also has Vitamin C derived to help lighten pimple marks. The 4th product is the Hiruscar post acne. This helps combat acne scarrings such as Hypertrophic scars and hyperpigmented scars. When to use it? After acne breakouts, you may experience post acne or pimple scarring and dark marks. This acne scar gel helps lighten dark marks and reduce acne scar appearance. You may use this 2-3 times daily once your acne has subsided and so happen, it left a mark or scar. Visible improvement can be seen after 4 weeks of consistent usage of Hiruscar Post Acne. FYI, the description in picture for Spot Gel is wrong. It should be Hiruscar Anti Acne Spot Gel and not Hiruscar Post Anti Acne Spot Gel. Kindly change. Be part of #ClubSpotless with these products that I have trusted for years! WIN A SAMPLE FOR BOTH HIRUSCAR POST ACNE & HIRUSCAR ANTI ACNE SPOT GEL! 10 LUCKY WINNERS WILL BE SELECTED.